Bambrella Side Wind Hurricane 3.5m Round Spuncrylic Parasol: This truly beautiful quality parasol is available in 10 colours of luxury Spuncrylic fabric. The frame is aluminium to ensure a long lasting rust free finish and the hub and runner are a marine grade nylon. The Parasol features a double rope and pulley system for easy opening and closing. 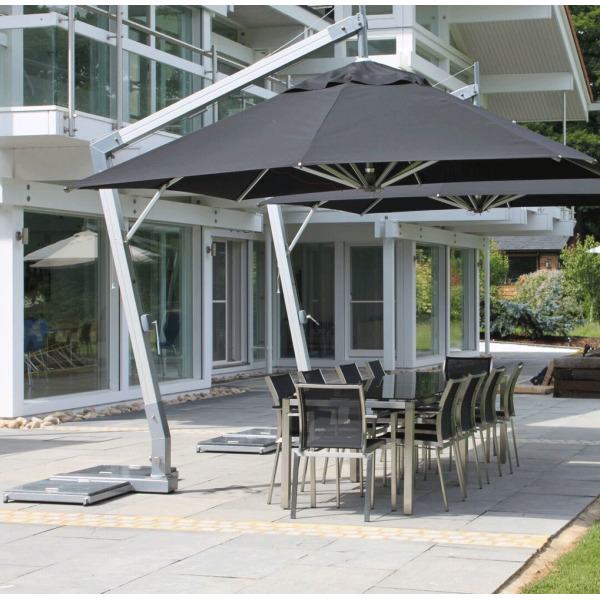 Whether you are using this parasol for domestic or commercial use you will have absolute assurance of quality. The parasol has been wind tested up to 90kmph and includes 2 x 70kg base slabs to keep the parasol exactly where you want it even in adverse weather. To provide absolute sun protection the UPF is 50 + and the base turns an impressive 360 degrees and the angle of tilt is up to 45 degrees so no matter where the sun is you can be sure you are protected.